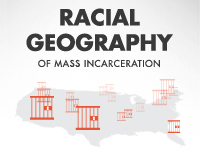 Recent report focusing on the Census' methods of collecting and tabulating race and ethnicity data addresses prison gerrymandering. Prison gerrymandering was one of the issues addressed in a recent report from The Leadership Conference Education Fund, Asian Americans Advancing Justice | AAJC, and the NALEO Educational Fund, Race and Ethnicity in the 2020 Census: Improving Data to Capture a Multiethnic America. The report focuses on the Bureau’s current and proposed methods of collecting and tabulating race and ethnicity data. OMB should convene a working group of experts from the Census Bureau, Department of Justice, state correctional departments, prison reform advocates, and other knowledgeable civil rights stakeholders, to evaluate the quality of race and ethnicity data on the incarcerated population and to recommend ways to improve the accuracy, completeness, and consistency of these data. For more information on the Census Bureau’s data collection practices in correctional facilities, see my analysis of the Bureau’s “Ethnographic Study of the Group Quarters Population in the 2010 Census: Jails and Prisons”. Census Bureau’s ethnographic study recommends further research in counting incarcerated populations: suggests improvements to use of administrative data and a look at collection of home addresses.